Delta has an offer out that seems to run along every once in awhile where you can get 1,000 miles after speinding $50 with this link: Gilt Groupe. Just register for that to earn the bonus. I don’t get a kick back for this link btw. *Offer available to all active SkyMiles members. Advanced promotional registration required. Receive 1,500 bonus miles on your first purchase from Gilt Groupe or Gilt City of $50.00 or more, excluding taxes and shipping until January 12, 2014 OR 1,000 bonus miles for your first purchase from Gilt Groupe or Gilt City of $50.00 or more, excluding taxes and shipping, made after January 12, 2014. 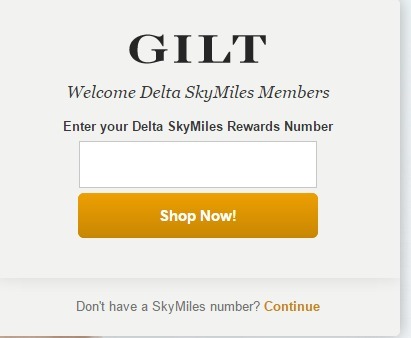 In addition, new Gilt Groupe or Gilt City members with SkyMiles accounts will earn 1 mile per dollar spent with Gilt Groupe or Gilt City for purchases made on http://www.gilt.com and http://www.giltcity.com for so long as this promotion is active and such member is a SkyMiles member in good standing with Delta. Miles are earned only on base amounts spent on merchandise or, in the case of Gilt City, vouchers, excluding any amounts attributable to taxes, credit card fees, shipping and delivery charges. Miles are non-transferable. Miles will not be granted, or may be revoked or debited from a member’s SkyMiles account if purchases or amounts spent with Gilt Groupe or Gilt City are cancelled or item(s) are returned. Offer may be suspended or terminated at any time. Offers are subject to change without notice. Other restrictions may apply; void where prohibited. Offer valid for new Gilt Groupe or Gilt City members only. Promotion is not valid on any Gilt Groupe or Gilt City mobile sites or apps. Also this offer depends on how much you value Delta miles as there are some other coupons out there that may or may no work with the bonus. You might also want to pay with your Citi card to get extra gilt insider points on top of the miles or other coupon.